There is no doubt that cloud computing is the trend in running businesses today. Whether you own a global company or a Small to Medium Enterprise (SME), a proper implementation of cloud-based tools and cloud services can significantly increase your productivity, client engagement, and more importantly; your company revenue. Now is the right time to shift to the cloud, if you haven’t done so already. To ensure a successful transition to the cloud, we listed these five essential steps for you to consider. Just like managing any business project, the first step is planning. Form strategic goals to guide the transition from start to completion. Create a project team with members from different departments to ensure all areas of the business are considered. Focus on your current business processes. Look for possible ways that cloud-based tools can improve them. It is possible that you will find it more effective to scrap an existing process altogether and develop a new one. If so, think about an effective strategy to end your existing processes without sacrificing productivity. Lay down a timeline for the whole transition and define the possible completion date. Be realistic about it. Give some leeway for unexpected challenges so they won’t disrupt your project calendar. Lastly, establish the most efficient way to communicate among team members and make sure that the line of communication is always open. The next step to ensure a successful transition to the cloud is planning for data migration. Data is the most essential asset of your business. Without it, you can’t establish a sound business management system. When making decisions, you need to consider things like preserving old transactions, security and backup measures, as well as creating reports. It’s best to include experts in data management and key business stakeholders during this stage to ensure that the best decisions are made. Make sure to consider data sensitivity, individual privacy, and statutory compliance when planning the data migration. Before going live with your new processes, User Acceptance Testing (UAT) can help you pinpoint possible problems and issues. Transitioning to the cloud will give you a chance to review your current business management systems and find out processes that can be simplified and optimized. Analyzing the best integration procedure, therefore, is very crucial. Proper integration will also help you create custom elements on the cloud services that will fit your new business processes. To help you do so, you must have experienced business analysts and solution architects that will make all of these happen and more. They can create more modern business management systems that will have better workflows and data management procedures for your company. Analysts and architects can also give you the right guidance on how to use the advanced capabilities of your chosen cloud-based tools and software. You also need to pledge enough resources to take advantage of the full capabilities of the cloud during the integration and customization phase. This isn’t just limited to the financial aspects, but also includes documentation and other business data that you can provide. Next in the essential steps to ensure a successful transition to the cloud is testing. You need to do this to make sure that everyone who will use the system will find it easy to transition a well. These people include employees, business partners, and your customers. Take time to communicate with all stakeholders and explain the new business direction and how you are utilizing the cloud to do it. Discuss the transition flow and the end goal. Set-up some events where they can experience the new system and cloud-based platforms, like training and online learning. To do the testing, process sample orders through your e-Commerce System. Simulate each step precisely and document all outcomes. This will help you determine room for improvements and increase the efficiency of the processes. It will also help you take advantage of the functionalities and new technologies included in the cloud-based platform. After the testing, conduct reviews on your cloud implementation plan. When transitioning to Cloud, data security should be at the top of your priority list. To help you to eliminate possible security risks, don’t hesitate to enlist the help from experts. They have better understanding of the complexities of integrating third-party applications to your own system. Communicate with your data security experts, your organization’s internal security, as well as the compliance requirements in your industry. Help evaluate the past performance and track record of your chosen cloud provider. Take time to ask the cloud vendor important questions that involve the use of your company data. Lastly, establish a disaster response plan with the cloud provider. 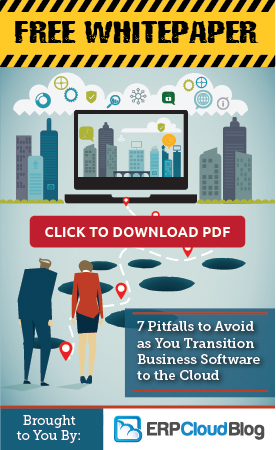 These five essential steps will help ensure a successful cloud transition for your company. However, if you want the best results with the help of an expert, then let Advanced Solutions & Consulting Co. guide you in your implementation. ASC has more than 19 years of partnership with different companies in the country for successful implementation and integration of Acumatica ERP Software, a leading cloud-based solution for SMEs and large businesses. Call us now or inquire online so one of our experts can help you ensure a successful transition to the cloud. Control You Can Count On – SAAS or Cloud?